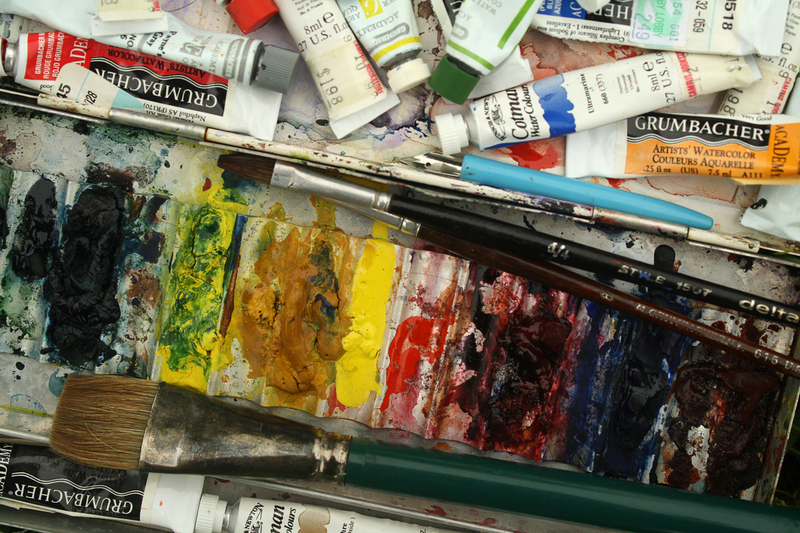 The banner photo* across the top of this blog is of one tray of Mother’s (Marion Gunderson) watercolors, a few of her paintbrushes, and her ink pen. Mother’s talent combined with these watercolor supplies has resulted in nearly $3,500 being donated so far to the Rolfe (Iowa) Public Library. Mother worked there for 35 years. The banner is a portion of the photo that is immediately below. In this next photo, Mother is with two of her grandchildren, Kevin and Abby, in Mother’s cottage on West Lake Okoboji. 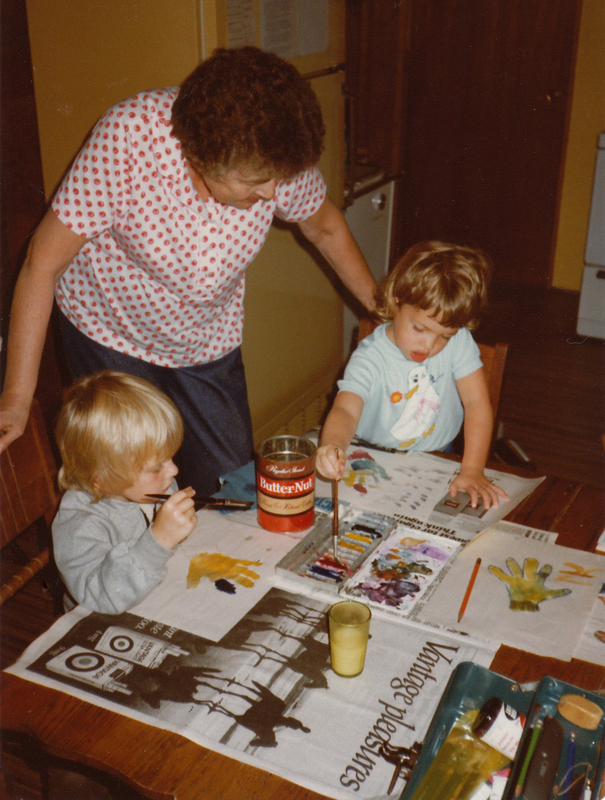 Mother was always a great one for bringing out her paints or other media for her grandchildren and inspiring their creativity. This (below) painting session took place in September 1981 when our family was at the lake celebrating Mother’s and Daddy’s (Deane Gunderson) 40th wedding anniversary. The impetus for this blog was provided by Mother’s watercolors. She painted watercolors as early as 1933 and as recently as 2000. She passed away in 2004. In 2009 while I had three of Mother’s watercolors at Wild Faces Gallery in Rolfe, Iowa, to be framed, another gallery patron, Ruth Simonson**, saw the watercolors and requested to purchase prints of them. As a result of Ruth’s request, various members of my Gunderson family funded the availability of prints of 28 of Mother’s watercolors. Images of notecards and 27 watercolors/prints as well as ordering information are available here. There is also a limited supply of most of the prints at the Rolfe Public Library and Wild Faces Gallery in Rolfe. The content of the watercolors/prints varies. Prints are of grain elevators (in Rolfe, Pocahontas and Gilmore City), several florals, train depots, the Iowa State University heating plant, pumpkins, an angel and more. *The watercolor supplies banner is seen today, July 2, 2011. At some point it will be replaced with another image. **Click here to read how Ruth Simonson first learned about Mother before Ruth became a member of the Barr Art Association with Mother. This entry was posted on July 2, 2011 at 9:06 am and is filed under Marion Gunderson. You can follow any responses to this entry through the RSS 2.0 feed. You can skip to the end and leave a response. Pinging is currently not allowed. Louise, I love the banner and photos and rehearing how your work to provide prints, and ultimately funds for the library, all came about. I really appreciate all you have done and for your creativity and labor with this blog.